DavidNews HYIP blog - News & Reviews: Control Finance – Long term runner? Control Finance – Long term runner? It’s another week and it is time for another review at DavidNews.com. Today I’m reviewing a new HYIP called Control Finance, which has joined our Golden Stage 2 days ago and has been online already for 3 days in total. I have re-invested $400, to keep an eye on it and let you know about the performance of Control Finance. Even though program looks very young, there is always something worth mentioning in the review about almost every program. Therefore, let’s take a closer look and see what can this program offer us! First let’s see what is this program about, to understand how admins are going to earn money. The company claims that profit is being made from trading on various exchanges such as Poloniex, BTC-e, Bitfinex, Bitstamp, and others. Most of you are already familiar with Bitcoin and know that its rate is changing all the time and there are possibilities to gain profit from the changing rate. I have recently seen many companies jumping on this train. Not sure how much space is left there. However, new cryptocurrencies are still being developed and it’s hard to predict what’s going to be the next big thing along with Bitcoin. More information about this HYIP can be seen on the bio page and the official Youtube video. In terms of quality and security, Control Finance website has SSL certificate, the server has a DDos protection and admin claims that all user information registered and their activities are discrete. Moreover, the HYIP owners on the website explain that instant payment mode is available for funds withdrawal and after testing I can confirm that payments are processed instantly. 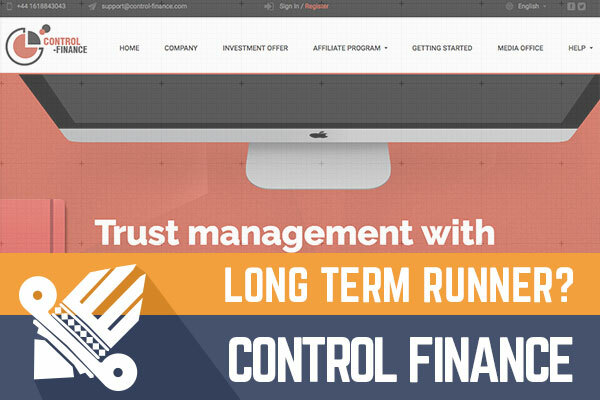 Control Finance website and platform is built on Gold Coders script with a custom-made design. Design layout and the design itself looks very generic. Moreover, their home pages have one of those header images showing work desk. I thought they are long gone, but it looks like some people still like them and are even willing to put them on the homepage of their websites. In terms of functionality, there is all most important information for a potential investor. I would expect to see information about investment plans right on the home page, but it’s a very subjective opinion based on the latest trends. However, the calculator looks very good and functions well. You can see daily, weekly, monthly and yearly earnings. Of course, the default deposit ($1000) in the calculator looks pretty high and most likely is realistic mostly for real pro players. It’s another company, which has done the homework by registering the company for the HYIP. Moreover, it’s another company registered in the UK. The unusual thing about this program is that the admin has decided to show not an only the certificate of incorporation, but also an application for register and document showing proposed officers of Control Finance. The company has been registered in September 2016. Often you see programs with incorporation dates only a few days before the launch, so a company that has been in the market for a while is something better than average. The company has been very active on their Facebook and Twitter accounts since the beginning of the May 2017. There are plenty of posts about cryptocurrency news in various countries, which might be interesting for some cryptocurrency fans. Even though communication approach seems nice, the success on social media profiles looks quite unrealistic. I mean there are interesting posts out there, but I don’t see many likes for them. Therefore, 2045 likes for FB and 3576 for Twitter accounts look like a result of a quick approach to social media marketing. I'm sure; you must have been waiting for the most important information – investment plans. Control Finance is offering 4 different plans, which are being assigned automatically based on your deposit. Interest rate varies from 1.10% up to 1.50%. As I wrote earlier, the calculator is very functional, but I still want to give you an insight of real profit in this program. For example, $200 deposit would be the first investment plan with the interest rate 1.10%. No matter which plans you choose, the deposit is not being returned at the end. Therefore, the given deposit would make 2.2$ a day and would reach its break-even point after 92 days. Such deposit would start making the real profit only after the 93rd day. In my opinion, the interest rate and break-even point look realistic to run the project for a long term. Unfortunately, you can’t predict what’s going to happen and how long will it work. As I wrote in the opening paragraph, there is always something worth mentioning about every project being monitored on DavidNews.com and Control Finance was not an exception. This program looks like a project, which is trying to attract long-term deposits with such low-interest rate. In the meanwhile, the fact that deposit is not being returned means that there is less risk of many investors withdraw their deposits at the same time and cause the collapse of the program. On the other hand, it’s a 3 days old program where you can reach the break-even point only after 92 days. Therefore, if you decide to make any investments, don’t invest more than you can afford to lose! Get Social Media Positions from the comfort of home! If you're looking to BUY bitcoins online, PAXFUL is the ultimate source for bitcoins as it allows buying bitcoins by 100's of payment methods, such as MoneyGram, Western Union, PayPal, Visa, MasterCard, American Express and they even allow converting your gift cards for bitcoins. BitKong Test your bravery and get bitcoins from the big angry kong. Have you ever consider maximizing your free BTC collections by using a BITCOIN FAUCET ROTATOR?